In honour of this infernal nasty unbreakable -30C and way more ( -46 in Stoney Rapids today, just North of us in the basin) , plus a blizzard last night, glacier forming levels of snow and nails popping like shotgun blasts on the roof, here is some interesting ways to tackle it all. Some different equipment for handling the perils of winter. 410007 and a cut of matching tunnel ice breaker box cars. Ballasted to 66 tons. Built by William Bros Boiler and Mfg. Co. Minneapolis, MN. Note: Bros is not short for brothers! Established 1893 and still in existence in 21st century! . 300 HP engine powers the auger. Clears path 14 feet wide. Tank holds 14,000 gallons of melt. 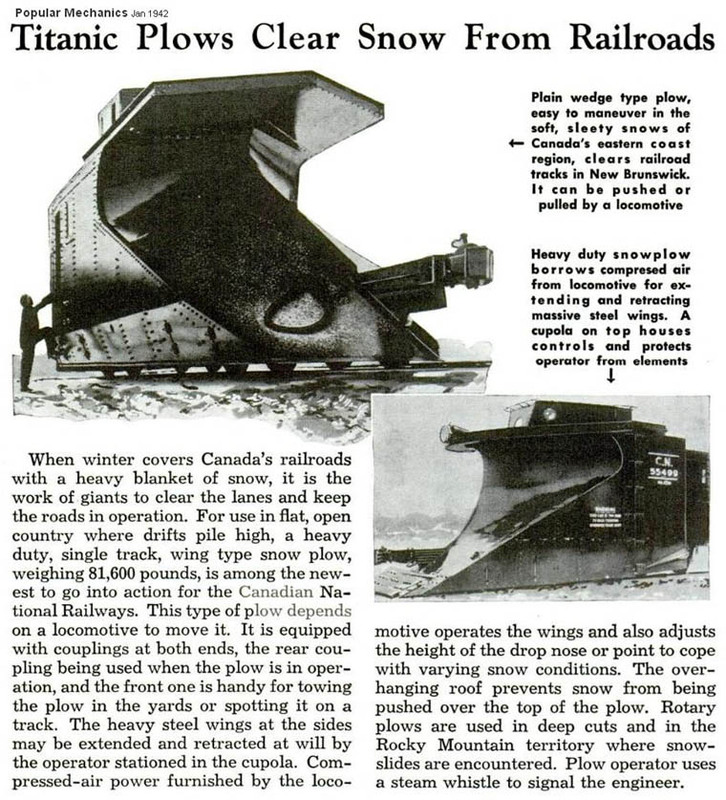 The rotary snow plough was invented in 1869 by Toronto dentist J.W.Elliot although he never actually built one. It wasn't until 1883-84 that Orange Jull of Orangeville, Ontario contracted with Leslie Brothers of Toronto to build one that was successfully operated in Parkdale on the old TG&B Wharf lead. 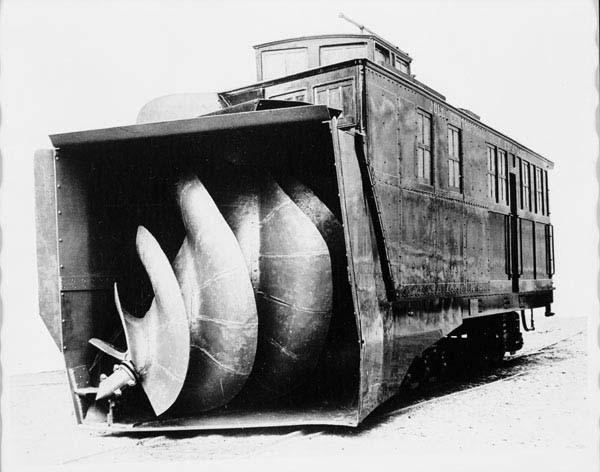 Jull later sold his design rights to Leslie Brothers, who formed the Rotary Steam Shovel Manufacturing Company in Paterson, New Jersey. Leslie Brothers contracted with Cooke Locomotive & Machine Works in Paterson to do the actual construction. 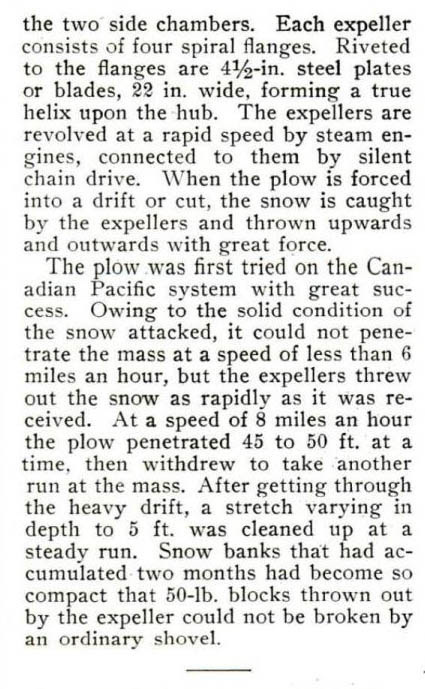 This may be an updated version of the Jull Centrifugal Snow Plough. There is nothing to indicate where on the CPR this was tried or if one was ever bought. "Tank holds 14,000 gallons of melt." Make me wonder just what "melt" was. Some kind of chemical compound? Brine? Whatever it was I'm sure it had to do the job without being dangerous to the crews. And that's some no-nonsense snow eating equipment! Like "As Seen On TV" kitchen utensils on steroids! "It slices, it dices, it peels, it juliennes! But wait, there's MORE!" Whatever it was it must have been more than just plain hot water. 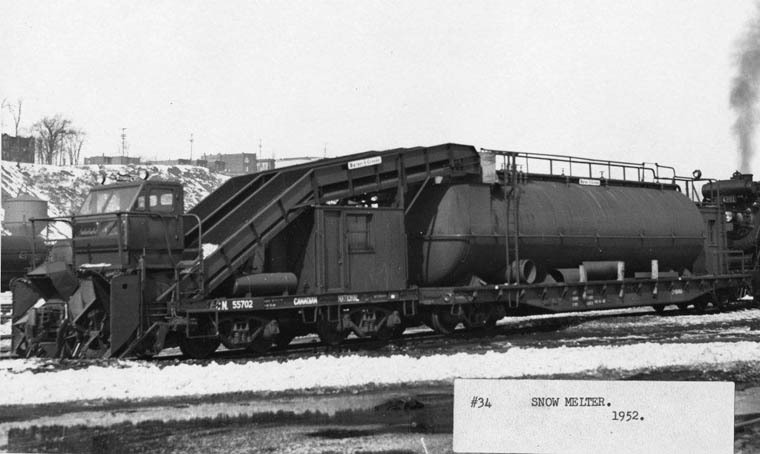 UP once tried using 844 as a snow melter to clear switches with steam. It melted the snow all right but left the switch parts covered in moisture which then froze, coating all the switch parts in ice. You're all dancing around which tender was used to build that snow melter. That's a big Vanderbilt tender all right. William Bros was in Minneapolis, and an original component forerunner of today's Caterpillar. 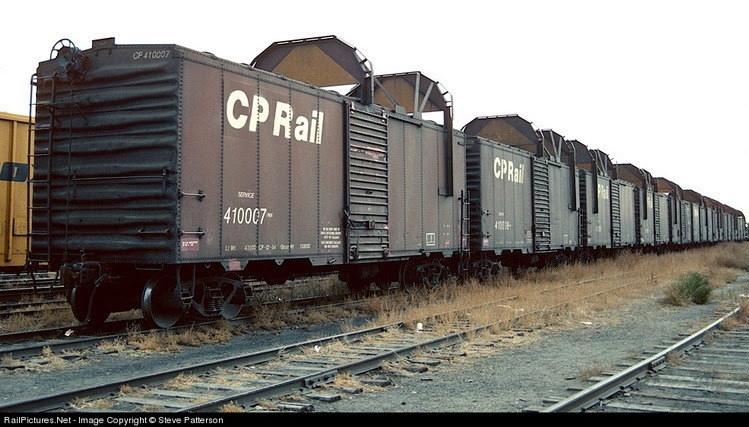 CPR did not use Vanderbilt tenders. Might be from Great Northern S-2 class Northern's. Also could be from Union Pacific 4-12-2. Busy day will search later, I'm sure someone knows for sure. In the meantime call these guys if you need your driveway cleared. You know, it did cross my mind as to whether that melt rig was a re-purposed Vandy tender, but I'm not so sure it was. 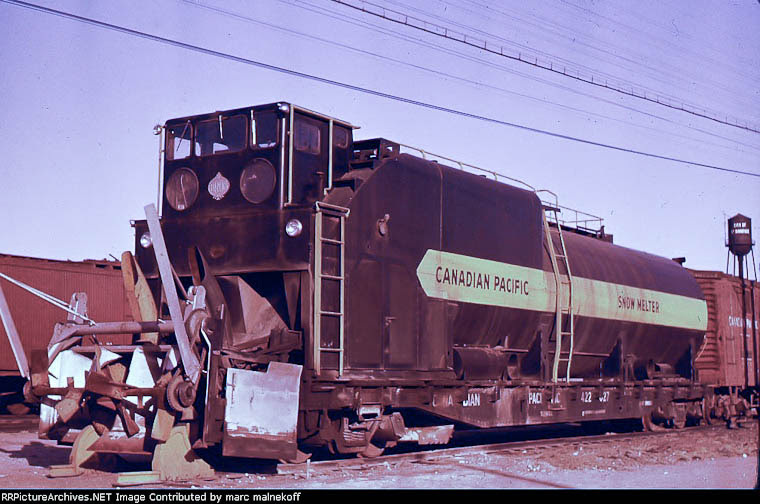 First off, it looks to have been built on a conventional flatcar, second that tank seems just a little too long, much longer than any Vandy tender tank I've seen pictured. But in the end, what's it matter? It's an interesting piece of equipment just the same. What is the point to melt the ice when the engineer is freezing. 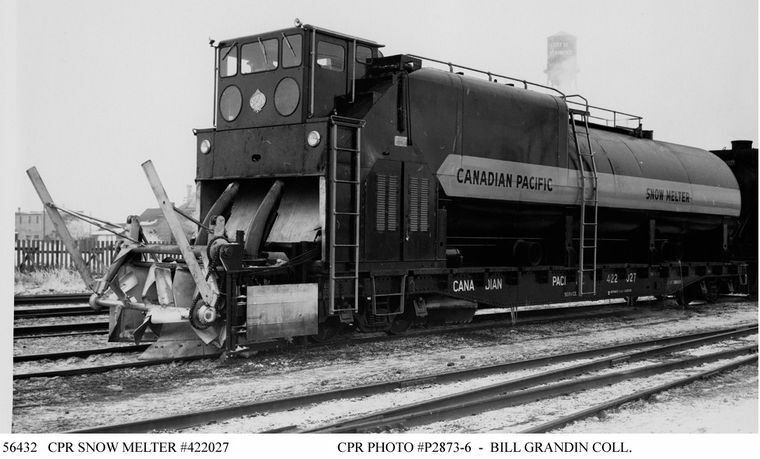 I don't think I've ever seen a CPR engine with a Vanderbilt tender. Wherever it came from it is very long. Almost looks like it could have been one of those three-truck B&O ones recently posted on String Lining. Were any rotary snowplows paired with Vanderbilts? 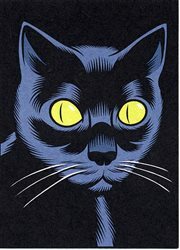 Now here is a curiosity. 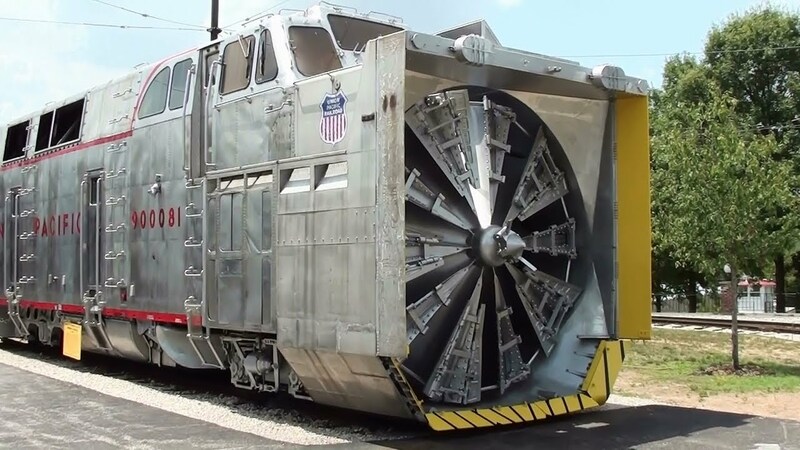 Double ended snow plow. Why? No wye , that's why. in ...Charlottetown, Prince Edward Island of all places. 55699 rare double ended plow used where no wye available at end of subdivision. Built 1939 Weight 71100. 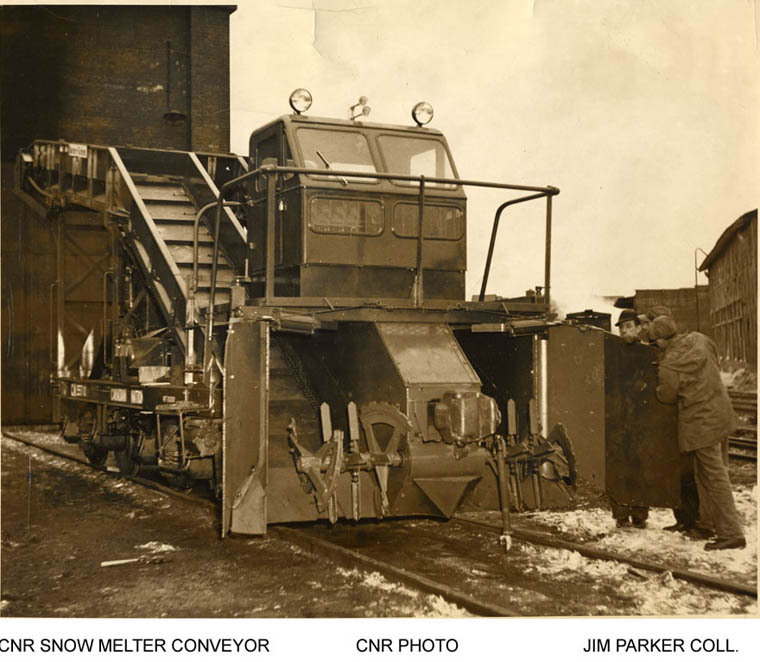 So we need something like this or the snow melter which Miningman posted. The theme was 'some different equipment for fighting Winter' and I was deliberately staying away from rotaries, except for those early inventions in the initial post. That UP rotary certainly looks formidable though. Rocks and tree limbs can stop a rotary cold however. 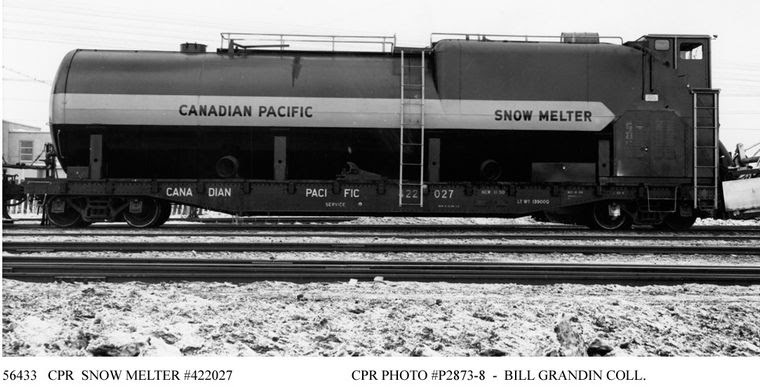 I like the icicle breakers on the CP boxcars at the top photo. They had them on top of their F's as well to protect the dome cars going through tunnels. I suppose each season has its own challenges and expenses. Floods in the spring, weeds in the summer, wheel spin from wet leaves in the fall, never ends! Despite all the hardware - the only thing that can hold Winter weather anywhere near a standstill in transportation is manpower, manpower in mass quantities with all the tools necessary. Here's a film I'm sure some of you have seen before, but for those who haven't it's called "Snow On The Run", a promotional film done by the Southern Pacific in the 1950's. There's everything in it, including the most important thing. As Balt says, guys with the right tools, in this case shovels and brooms. The film starts at 3:00 after an intro by Walter Grey of the California State Railroad Museum. In Montreal Yard in Seventies. 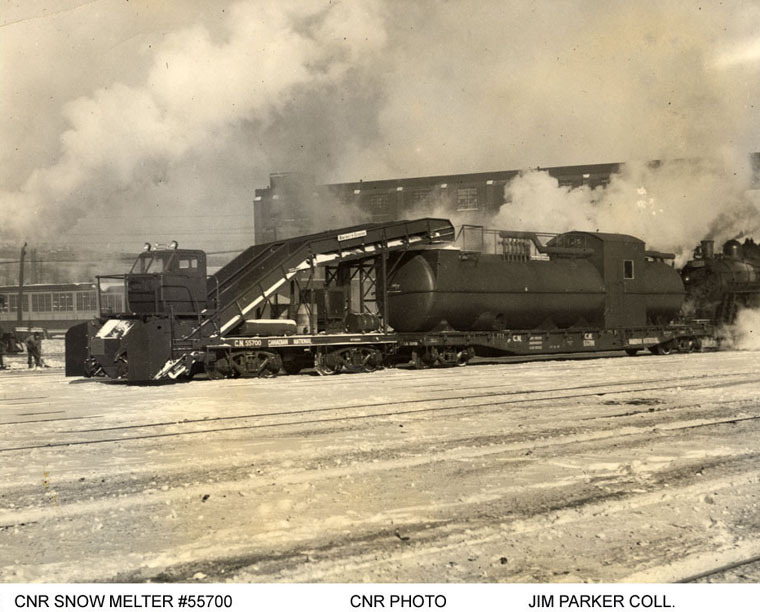 CN 4190 w steam connection from steam dome for aformentioned Snow Melter. 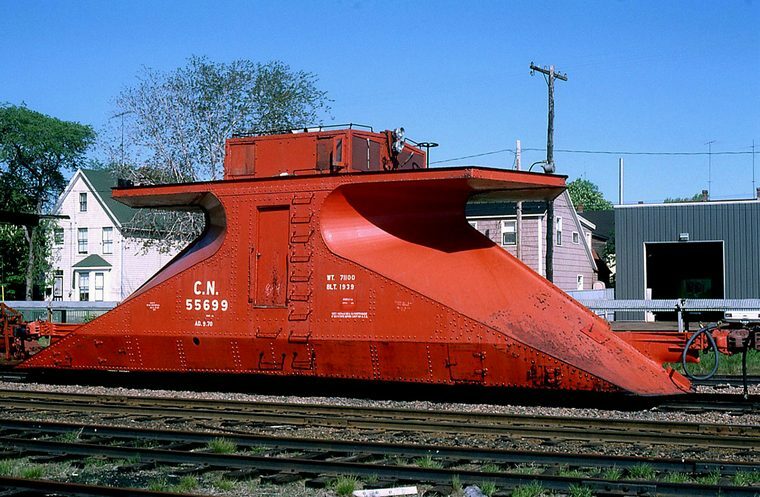 CN# 50560.... WOW! This thing has winter coming and going! I would not believe it if I didn't see it... a five digit numbered locomotive to boot. 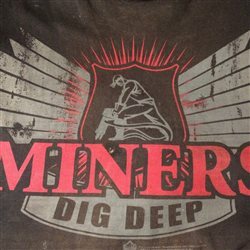 Whooleeee Smokes to the whole rig! Does Mad Max know about this? I tried to sell my two cents worth, but no one would give me a plug nickel for it. I don't have a leg to stand on.